Favourite game: Pretend to be sleeping when it's too cold to go out to pee! We love our Becky who combines the best of both of her parents, she was born to us at a sad time in our lives and has been a ray of light since she was born. 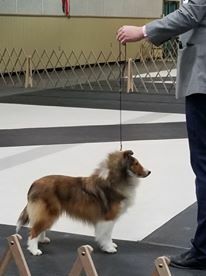 Becky loves to show and finished in only 3 weekends out with all 5 point wins beating out large quality entries every time. she has already graced us with a beautiful little daughter and we can't wait for Becky to mature a bit more before heading back into the ring. It's always an adventure with Becky!